This recipe reminds me of summer (and my beloved Spain!) and is, as many of the tapas recipes featured on the blog are, quick and easy. It only takes 6 ingredients and less than 15 minutes. If you want a thicker sauce, add flour into the mix after sauteing the garlic and cook (over low heat) for 10 or so minutes. Traditionally the recipe uses olive oil but hey, I like my butter and the richness it lends the dish (and anyway - butter is what my favourite tapas bar in Benalmadena uses, too!) If you want, you can add a pinch of saffron into the sauce too after adding garlic. Melt butter on a pan. Add bay leaf to infuse it for a couple of minutes. Then add finely chopped garlic and sauté until soft. Keep the heat fairly low so it doesn't burn. Then add white wine and bring to boil. 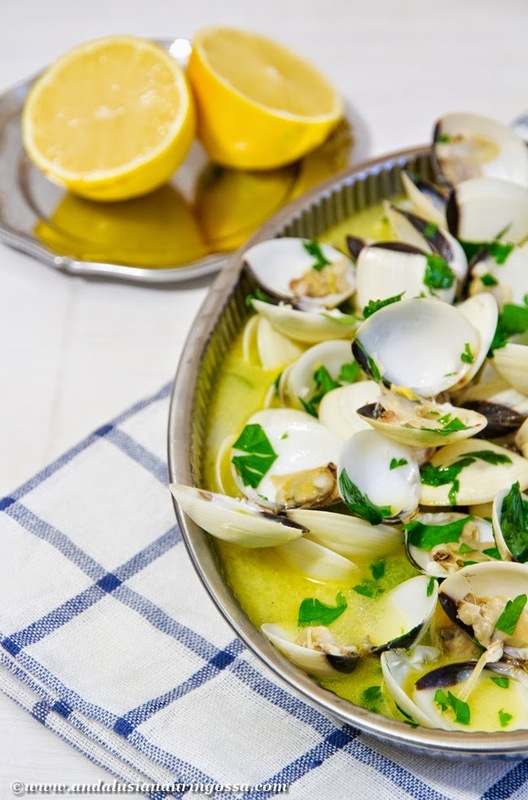 After 5 minutes, add clams and half of the parsley. Cover and cook for 5 minutes until clams have opened. Check the taste and season as needed. Scatter the remaining parsley on top and serve. With chilled white wine, lemon slices and wonderful crusty bread.